In addition to participating in Concert Band, Symphonic Band, Wind Ensemble, and/or Marching Band, percussion players may try-out to participate in Drumline. This group schedules independent practices and performances, and enhance school spirit by marching through the school hallways the mornings of varsity football and basketball games. 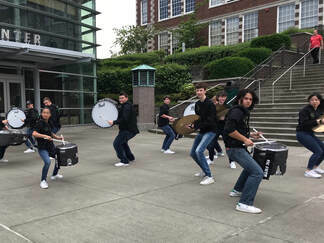 Roosevelt Drumline is, first and foremost, a student led organization. Our parent liaison, Amy Benward, may be reached by email at bcaalb@comcast.net. Our snare line (in order below: Emma, Jackson, Henry and Wilson) was awarded best snare line at the competition.